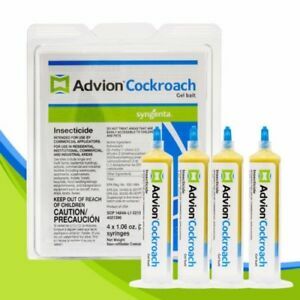 Advion Roach Cockroach Killer Bait Gel 4 Tubes + Free Tips & Plunger! 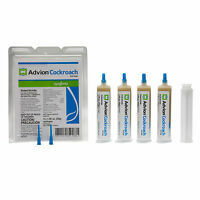 ADVION ANT Killer Gel Bait 4 Tubes with Plunger and Tips - KILLS ANTS FAST!! 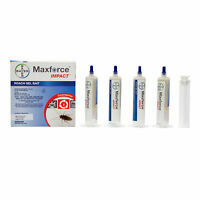 This kit comes with four tubes of gel bait that is irresistible to cockroaches. This bait works on a variety of roach species. 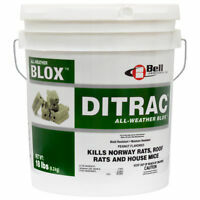 It is suitable for use in personal homes as well as in public buildings and vehicles. There are 205 items available. Please enter a number less than or equal to 205. Immediate payment of US $28.79 is required. I live in a large city building with often cockroach infestations. The only thing that has helped my family keep our apartment cocroach free is this Advion Syngenta Gel bait. And also, it works on all different types of roaches because we had 3 kinds of them infesting our building in past ten or so years. I reccomend this product, from my own experience. After buying can after can of spray, using bait stations and gels from the stores I had all but give up on getting rid of roaches. I seen this and thought it was a bit pricey but wanted to try it anyway. This stuff is amazing! I put one tube out to see if it would do anything. The next morning my floor had hundreds of dead roaches on it. It took the whole four tubes to take care of the problem, but I am roach free finally! !! I am ordering more just incase more come from the neighbors house. No smell no mess easy to use. Just be ready to live in a roach free home. I live in an 8-unit apartment building. I'm extremely clean but I can't say everyone here cleans the way I do. I saw several roaches in my kitchen and immediately went online and found this item. I researched it and felt like it would work for me. I didn't have a huge problem with them just a few that had wandered into my apartment but I still didn't to see them period. Once I received it in the mail I used as directed I just put some tiny drops in the kitchen and bathroom. Within 1 day I found a few dead ones and by day 2 I never saw another one. My downstairs neighbor was having the same problem not a lot just saw a few here and there in the kitchen I gave her a tube and it worked the same exact way for her and neither one of us have seen one since and that was 2 or 3 weeks ago. I highly recommend this product it not only works but gave me peace of mind. We're both going to use once a month for maintenance. My brother uses this in his rentals. A little dab in a few places usually does the trick. He has literally had to sweep up bags full of roaches after putting this out. My daughter has used this to get rid of "tree" roaches in her garage. No avoidance or immunity shown after several years of use. Can't say enough good things about it. Highly recommended! I moved into a home that had a very heavy infestation of roaches. I had spent over $200 on products with no success of getting rid of them. A friend told me about this so I ordered it right away. I put it all through my home and I am find dead roachea everywhere every day. It's been about a week now and I rarely see a live one but my infestation was horrific ao I expect it will take a couple of weeks to rid them all but I highly recommend this product!!! I will be ordering more to keep my house baited all the time to make sure the reaches don't come back!!!!!! Don't waist your money on other products just buy this first and you will be glad you did!!! !